Thwack. Down came the elephant’s trunk on my head, in a gesture of blessing. I was surprised at how gentle it was, gentle giants indeed. We were in Trichy, Tamil Nadu to attend a wedding at our family friends’ home and the temple elephant was here to bless the newly weds, to flag off their journey together on an auspicious note. Even though I grew up in a traditional South Indian family this was completely unexpected. After all, it isn’t everyday that a majestic elephant walks into a wedding! But, knowing where I was, it shouldn’t have come as a surprise. Amongst the many interpretations of how this town got its name, one that particularly sticks in this case is that, Tiruchirapalli could have come from Tiruchinnapalli, which when broken down means Holy Little Town. Or even Tirussilapalli, meaning Holy Rock Town. Which brings us to the Rockfort Temple. 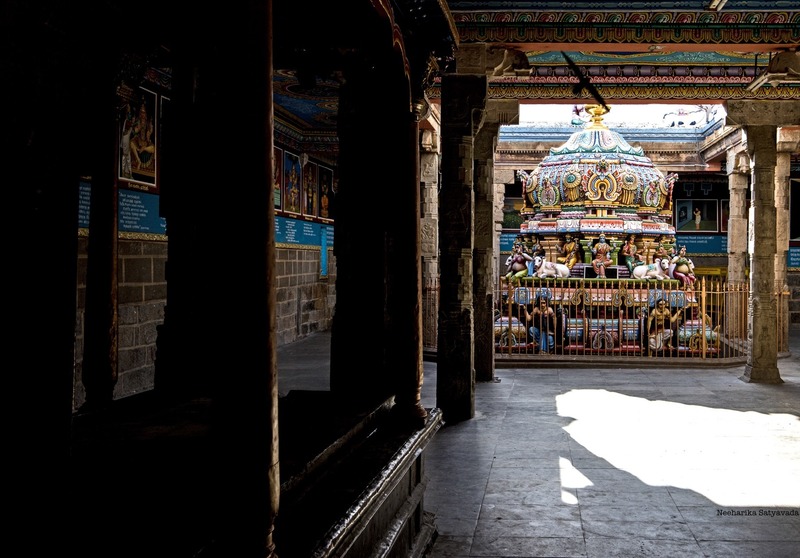 Tiruchirapalli or Trichy as one familiarly calls it, has always been an important religious centre for the Hindus with many a prolific and ancient temple peppered around town. From the more famous Ranganatha Swamy temple of Srirangam to the Rockfort Temple, which has come to be a symbol of this temple town. I am yet to see a temple so striking and haughty in its simplicity, as this one. Sitting on a 272 feet rock, right in the centre of Trichy, it draws your gaze in, from wherever in the city you are, like a pivot. So, here is where we went first, this intriguing fort-temple on the rock. As we wound our way through the busy bazaar at the foot of the rock, I really did not know what to expect. There were the usual lines of people going about their prayers – visible from the busy street – in the Ganesh Temple which was right there. But did Ucchi Pillayar Kovil not mean Ganesh temple at the top, literally? It was then that our guide explained to us that there are two rock cut temples in the fort, the lower and upper cave temples. Having paid our respects at the Manikka Vinayakar Temple, the lower cave temple, we began the steep climb of over 350 steps through the ancient rock that dates back to over a billion years ago. Of the many cave temples that we passed by, cut into this monolithic rock, the oldest was built by the Pallavas in 580 AD. The biggest in this complex though is the Thayumana Swamy Temple dedicated to Lord Shiva and his consort Goddess Parvathi, spanning a length of two stories in a regular building. Stunning though it was, right from its architecture to the colourful murals painted on the walls of the cave, it is the Ganesh temple sitting right at the summit that takes your breath away. As you come out of the caves and struggle to climb up the sheer rock face to reach this temple, you are bound to pause for breath and that is when you realise just how picturesque the panoramas that it offers of the city look. As the breeze blew cool in my face I caught my first glimpse of Srirangam, from inside the Ucchi Pillayar Kovil. Getting There: Sitting right in the center of Tamil Nadu, Trichy can be reached by road from Chennai in 6 hours. There are also regular flights from Chennai to Trichy. What colorful murals! Nothing really matches south Indian temple architecture!